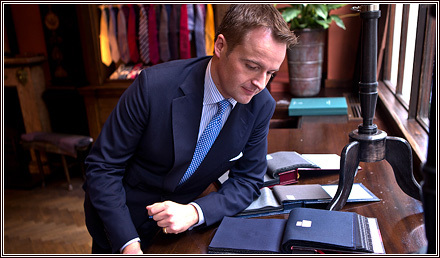 When customers come in that have never ordered bespoke before, the choice of cloth can be a little overwhelming. It is a lot of bunches to pick just one material from. So I tend not to get too many cloths out at any time – otherwise it can be a little like being surrounded by sweets in a sweet shop! It is useful if the customer considers a few things in advance, like whether he wants a blue or a grey suit to start with, and what times of the year he wishes to be able to wear it. If he wants a business suit to be worn most of the year, as most new customers do, then I would recommend something in an 11 or 12-ounce weight. If already has some suits and wants something wintry, we might go for between 13 and 15 ounces. It is not necessary to know anything about weights in advance, however. A quick conversation about when the suit will be worn is enough. When building a wardrobe customers may well focus on a plain cloth for their first order. We can go with stripes, but they tend to be for the second or third suit. Checks are often for customers a few suits down the line but they’re not necessarily to everyone’s taste. Even a plain cloth has a few options though, like serge or pick and pick for example, so I will present a few options in different weights and textures, from different merchants. Again with the various producers, it’s not necessary to have any knowledge before coming in. Other than the difference between British and European producers (the latter tend to be lighter and have more of a sheen). Within similar designs form different merchants there is variation, so I suggest feeling every cloth to understand its characteristics. I always recommend buying a suit in the morning. The light is often better. In fact, about 11am is the best time – then you can have a cup of tea or coffee as you make your choice! Whether morning or afternoon, though, it’s worth looking at the cloth at the window or outside, in natural light. And if the customer wants to consider his options at home, we can order a swatch to send him. Many people find this an easier way to make a decision.